The Venice Diaries: Rick Alverson's 'The Mountain' shows us the perils of an American "antiseptic utopia"
Filmmaker Rick Alverson has never made films that are easily comprehensible to an audience. His work is the antithesis to the American superhero movie. From his first work 'The Builder' in 2010 he's proudly yet quietly worn the "independent filmmaker" badge of American moviemakers. In the tradition of greats like Dennis Hopper and John Cassavetes who came before him. In his latest film 'The Mountain' which premiered in Competition at this year's Venice Film Festival, Alverson throws the audience a proverbial bone. What I mean is that 'The Mountain', starring Jeff Goldblum and Tye Sheridan, is as close to a traditional film as we will ever get from Alverson. While he still describes it as "an anti-utopian film" in his director's statement, 'The Mountain' takes the audience through a hippie trippy ride on a sparse, pastel hued rollercoaster with few words, great acting, haunting images and sounds and by the end, leaves us feeling lobotomizes. I could swear the entire crowd of the Sala Darsena, where the press and industry screening took place the day before the film's official premiere, walked out with a very specific look on their faces. Not unlike that of the leading character of Andy, played by Sheridan. It is immediately clear, from the beautiful black and white shots and the poetically intimate details that 'Roma' is a very personal film for Alfonso Cuarón. At times, the real-life inspired story of a middle class family in the Colonia Roma neighborhood of Mexico City, told through the eyes of their housekeeper Cleo, felt so private, so confidential, it seemed like I was intruding on something really special. But I still could not bring myself to look away, I didn't want to stop watching, I also didn't want the film to end because for more than two hours, Cuarón paid homage to womanhood. It takes a big man to do that and an even bigger filmmaker to get the message across. Forget your tired, old costumed superheroes. It is time to reconnect with the original all American champion thanks to Ryan Gosling, in Damien Chazelle's latest masterpiece 'First Man'. The opening film at this year’s Venice Film Festival makes cinematic dreams come true. The Venice Diaries: Forget what you've heard, this year's festival is all about women's stories! So you may have read by now that the Venice Film Festival is being singled out for not having enough women filmmakers in their Competition line-up. One publication even went so far to criticize Italian culture as a whole, and they used two non-Italian reporters to write the story of course -- one the token male journalist. Because a single, lone, able woman journalist would not have been able to do the job? Ever hear that saying "don't talk bad about my mama?" Anyway, while everyone is up in arms for yet another slight at womanhood, I say, get over it! I'm a woman, I'm Italian and I feel very well represented in Venice -- thank you very much. In fact, I have never seen so many beautiful women's stories, so much truth for our gender and so much care in telling those stories as I see in the various line-ups and sidebars this year at La Biennale del Cinema. But of course, you'd have to look beyond the media-selling headlines, watch deeper, dig in the sidebars too and know in your heart that great cinema was never about gender, rather about quality and vision. Just like it ain't about politics, even when the subject is political. As I sat for breakfast this morning with Meredith Taylor, a fellow writer, she said something that struck me, because it's so true. "Before I started coming to Locarno, I would look at their yellow and black logo and think, it must be a chic and exclusive festival for true film lovers." I paraphrase a bit but you get the message. In fact, coming personally to the Locarno Festival for the first time last year, I too felt that they constantly and continuously impressed me with the quality of the films they select, but also the incredible devotion the festival has to the cinematic art. It's true, it is chic -- I mean just look at Meg Ryan in her white dress against that backdrop on this website's Homepage -- it is exclusive, yet totally democratic and wonderfully interactive. The only thing that is requested for you to join this club too is a love, a true passion and devotion to cinema. Wow. What's there not to love in a festival like this?! The greatest thing about the Locarno Festival is how accessible their venues are and how organic an experience watching great cinema becomes here. As author and filmmaker Emmanuel Carrère pointed out earlier, he is in Locarno on Jury duty, while at other festival you basically know what you can expect, here it's wonderful because the discoveries you make are completely unexpected. Personally, I find it perfect to get up in the morning and catch the press screening of competition films at 9 a.m. at the Kursaal cinema and return there after lunch for more great things. Also sprinkled around town and culminating in the Piazza Grande screening each night, there are many wonderful films to be discovered. I mean, like Meg Ryan said during our public chat this past Saturday, the "Piazza Grande has 8,000 seats!" Now wrap your head around that. The Locarno Diaries: Meg Ryan, Meg Ryan, and yes, Meg Ryan! Yes. You read the title right. I didn't make a mistake, I meant it to read that way. A bit of background first. I grew into my skin watching Meg Ryan's films. Notice I didn't say "grew up" because Ms. Ryan and I are from the same generation -- and yes, we look damn great! Thank you. But as I was saying, I discovered the America I always knew existed, I found love, I dumped love and moved on, I cried a lot in between, and all to the rhythm of Meg Ryan's movies. So when the Locarno Festival asked me to moderate a public Forum talk with the wondrous actress I said YES! And pinched myself a few times to make sure I wasn't dreaming. The Locarno Diaries: Ted Hope, Bruno Dumont's vision and the luxury of pressing "pause"
A great film festival for me is defined not only by the quality of films I get to watch but also the meetings and chance encounters that happen along the way. In a queue waiting for a film to start, sitting in the lobby of a hotel waiting for an interview and sometimes, just stopping for a whole hour or two in the midst of the hectic festival schedule makes all the sense in the world. I tried this yesterday afternoon and went to visit a friend in the restaurant of The Belvedere hotel, a good while after lunch and as interview junkets were being conducted all around me. It turned out to be the best decision of the day. As I flew over to Milan to reach Locarno then by car over the Alps, I watched 'The Gospel According to André' on the plane -- the documentary about the grand fashion figure that is André Leon Talley. It was a perfect way to dive into the Locarno Festival since Talley's life has been all about courage and bold choices and this year's film festival is channeling that spirit exactly. Also, as a woman I find solace at an event that kicks off with a press release announcing their commitment to sign the Programming Pledge for Parity and Inclusion in Cinema Festivals for parity and equality in the industry. Locarno will be the first festival after Cannes to commit to this pledge. So on August 5th at 9.45 a.m. Marco Solari, Locarno Festival President and Carla Speziali, Locarno Festival Vice President, will gather at the Spazio Forum to publicly and officially sign the initiative by SWAN, the Swiss Women’s Audiovisual Network, a sister movement to the French 5050x2020 campaign that took place on the steps of the Palais this May 2018 during the Cannes Film Festival. With today's official announcement of Carlo Chatrian having been chosen as Artistic Director of the Berlinale starting in 2020, the Italians have truly taken over world cinema. Now, let me explain. Apart from, obviously, Alberto Barbera at the Venice Film Festival, Giona A. Nazzaro at Venice Critics' Week, Antonio Monda at Rome FF and Emanuela Martini in Torino, there are several more Italian cinephiles sprinkled around, now heading film festivals around the world. Take Marco Müller in Pingyao China and Eva Sangiorgi who was appointed head of the Viennale back in January of 2018, after former director Hans Hurch suddenly passed away last July. Then, just a couple of months before the Cannes Film Festival was set to kick off, another announcement rocked the film world when it was made public that Paolo Moretti would replace Edouard Waintrop as General Delegate of the Quinzaine des Réalisateurs starting with the 2019 edition of the beloved sidebar on the Croisette.So why are so many Italians snagging the top spots at these most coveted of film festivals? Well, I have a couple of theories. It was the best of times, it was the worst of times. Actually, this edition of the Festival de Cannes turned out to be a missed opportunity, for media and juries alike to truly take charge of the #TimesUp movement and make of it a lasting course instead of a passing trend. Yes, there were stairs filled with women in pretty dresses, there were hotlines that we could call if we felt threatened or harassed, but ultimately the big prizes went to the big boys. As they have for every edition of the festival, except once, in 1993 when Jane Campion made history as the first and only woman to win the Palme d’Or. Yet personally, I loved Cannes more than ever this year. I had a soft place to fall, in the form of a wonderful group of friends I spent my free time with, eating dinners we cooked together and drinking our morning coffee back at our cozy apartment with one breathtaking view. I mean, just look at the Disney fireworks for 'SOLO: A Star Wars Story' display from our terrace! The winner of the Palme d'Or has been announced and predictably, it's still a male-directed project. There are too few opportunities for us women around and when one of us seizes the chance, we must deal with men (boys?) putting up passive aggressive resistance all the way, and other women trying to take us down. So, in my humble opinion this "5050X2020" movement which culminated as a red carpet moment may be fun to say and bound to light up with feminine glamour the famous staircase in Cannes, but it is not going anywhere until we aggressively and definitely take up our rightful place. And yes, call me angry, go ahead. Make my day. The Cannes Diaries 2018: 'Lucia's Grace' ('Troppa Grazia') is a miracle of a film! One of the freshest and most romantic films I watched in Cannes was Gianni Zanasi’s ‘Lucia’s Grace’ which screened in the Directors’ Fortnight section. On Thursday night it was awarded the Label Europa Cinema prize and personally, I was elated. Zanasi’s film is another one of those modern Italian cinematic gems that have brought me home. Quite literally. I moved back to my birth country five years ago because its newest wave of movies and filmmakers made me once again proud of being Italian. And Zanasi’s film also features as Lucia one of the most exciting young actresses in indie cinema today, Alba Rohrwacher, whom we can definitely claim as Italian but who is so much bigger and better than that label alone. Her wit, the way she can take the most basic of characters and build around them grand nuances and subtle mannerisms make her so cool that she may as well read the phone book on the big screen. And I’ll pay to watch that. The Cannes Diaries 2018: Jean-Bernard Marlin's 'Shéhérazade' is a "luminous love story"
From the black and white stock image reels that kick off the titles of Jean-Bernard Marlin's 'Shéhérazade', the viewer knows they'll be experiencing something different. Even though the film could at first glance appear to be yet another Romeo and Juliet type romance between star crossed lovers, it quickly unfolds into something much more unique and spellbindingly truthful. Seventeen year old Zach (played by Dylan Roberts) comes out of jail in his native Marseille, only to find that his mother isn't picking him up, she seems to have forsaken him. He is thus taken to a group home and quickly escapes only to try and reconnect with the life that sent him to prison in the first place. But one day, his friends take him to find a prostitute, and there he meets a girl, Shéhérazade (played by Kenza Fortas) whom he remembers from school. Their encounter isn't romance perfect at first, though their "meet cute", the moment in which their stars cross in cinematic terms is perfect. And perfectly human. Will they make it despite the entire world seemingly being against them? In the midst of the screening of Alice Rohrwacher's latest 'Happy as Lazzaro' ('Lazzaro Felice') I was overcome by a nearly unbearable sense of pride at being Italian. It's something I've come across one or two times before and I believe it is due to this new wave of fellow compatriot filmmakers who have brought back the idea of magic to Italian cinema. As I sobbed in my seat, I realized that all the inspiration that lacked in our movies from about the late Seventies to now, has surged powerfully into a movement that has infiltrating the old status quo and created a brand new tsunami of talent in the process. And that simply takes my breath away. When I sat with Rohrwacher a day later, she admitted that while in the past there existed a competition between Italian filmmakers as to who would be named the best one, now there is a stronger sense of community among the younger talents and that has made for better cinema. At the center of filmmaker Lukas Dhont's groundbreaking first feature 'Girl' -- screening at this year's Festival de Cannes in Un Certain Regard -- is a teenager who wants to be a ballerina. Complex, as all teenagers typically are, beautiful, painfully honest and exquisitely feminine, the only twist here is that Lara was born a boy. And it's obvious from her very first moments on the screen that having that part of the body which separates the boys from the girls is something utterly unbearable for Lara. But instead of creating conflict around this beauty, be it coming from her family, friends and the world at large, Dhont brings us instead into a world where a girl born into a boy's body who begins treatment to transition to her true self when we first meet her, has all the support she could ever hope for. And yet, her own passions, her self discipline, her sense of displacement inside the body fate dealt her at birth create enough strife, hold-your-breath moments and emotions to fully charge a one hour and forty-five minutes film. And fill our dreams for days and days to come. Road movies have been done throughout the age of cinema every which way possible in film. And yet, the formula is so perfect that hardly I've found a dissonant note when it comes to taking a story on the road, on the big screen. In A. B. Shawky's 'Yomeddine', which screened in Competition at this year's Festival de Cannes, the central idea remains that of a journey across the land but the Austro-Egyptian filmmaker -- yes Shawky's mom is Austrian, his father Egyptian and he grew up there -- substitutes the usual characters with two wonderful outcasts who charm their way into our hearts, slowly but surely, and manage to take up home there. Beshay is a small, disfigured man from a leper colony and the Pancho Villa to his Don Quixote is a little orphan boy named Obama. Both Rady Gamal, who plays Beshay and Ahmed Abdelhafiz who plays Obama are on their first acting roles in 'Yomeddine' and their freshness in experience is only paralleled by their awesome talent. Whenever the film could have played on our emotions too heavily, because of its intense subject matter, Gamal and Abdelhafiz find it within themselves to carry us through to the other side, and inspire, fill us with hope in the process. The Cannes Diaries 2018: The Doha Film Institute continues to "grab at the stars"
Best selling author R.A. Salvatore once wrote "It is better, I think, to grab at the stars than to sit flustered because you know you cannot reach them." In all they do, and how they unrelentingly and tirelessly support filmmakers, the Doha Film Institute folks prove time and time again that they are grabbing at the stars, not sitting by, flustered. After having been to Qumra this past spring, I can't imagine the Arab cinema landscape without the presence of DFI. In fact, even after the Dubai International Film Festival called off its 2018 edition, because of DFI's mission I remain hopeful for the future of cinema in and from the Region, and I know I'm not the only one to feel that way. This year, in fact, in Cannes there are six DFI-supported films. In the main Competition, there are Nadine Labaki's 'Capharnaüm' -- check out my interview with the filmmaker in The National newspaper -- and Nuri Bilge Ceylan’s 'The Wild Pear Tree'; ''Sofia' by Meryem Benm’Barek and 'Long Day’s Journey Into Night' by Gan Bi are screening in Un Certain Regard; and in the Directors' Fortnight sidebar audiences will find both 'Weldi' by Mohamed Ben Attia and 'The Load' by Ognjen Glavonić. So, if you thought that DFI was only about cinema from MENA think again! This year the festival holds a lot of promise. Arab cinema is at its center with an unprecedented two films in Competition, Nadine Labaki's 'Capharnaüm' and Abu Bakr Shawky's 'Yomeddine', while there are of course quite a few other titles sprinkled among the sidebars, including Mohamed Ben Attia's 'Weldi'. A newly formed Saudi Film Council is occupying a harbor-side pavilion and offering wonderful panels (including one on Sunday the 13th at 11 moderated by yours truly and featuring Annemarie Jacir, Haifaa Al-Mansour, Lamia Chraibi and TIFF's own Cameron Bailey) as well as much welcomed Arabic coffee and dates. When I dropped by on a late afternoon I really cherished that cardamom and saffron infused shot of Arabia and the hospitality brought me back to my days in the Gulf. The Cannes Film Festival 2018 line-up -- UPDATED! All of us may remember that last year's Palm d'Or winner 'The Square' was not in the original lineup announced at the press conference for the Festival de Cannes 2017. So a few more titles may come in the later days, like Sorrentino's 'Loro' -- a tricky release date for the first half of this six hour movie in Italy at the end of April is probably puzzling the festival organizers -- and the infamous Lars Von Trier. I mean, today with the kind of fascist governments that are in place all over the world, his words and behavior seem meek and subdued. And the visionary that is Cannes artistic director Thierry Fremaux I'm sure realizes that. Personally, I'm proudest of the two Italian films in the Official Competition this year, Matteo Garrone's 'Dogman' and Alice Rohrwacher's 'Lazzaro Felice'. 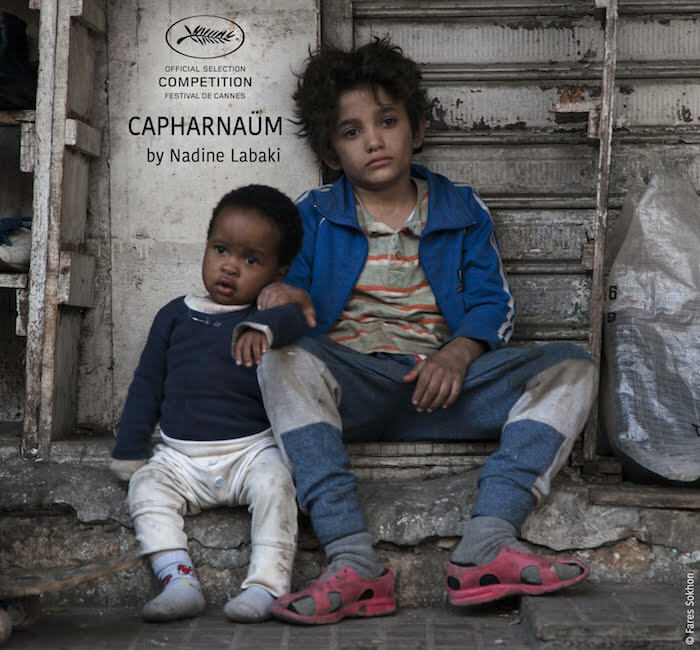 And of course, Nadine Labaki's 'Capernaum' and Jafar Panahi's 'Three Faces'. Not to mention the excitement at both Spike Lee and Jean-Luc Godard being in Cannes -- two grand Maestros of world cinema.